when you log in remotely. This page will show you two ways to make your remote use of a Unix system as pleasantly graphical as using it locally. We will consider VNC, then X11. You probably want to use VNC since the software you need to install on your client computer is very minimal, the experience is identical to using the Unix machine from the console, and your session persists even in the face of client or network failure. If you'd like to use Microsoft Windows XP remotely, you can use its built-in Windows Remote Desktop feature, which is very similar in functionality to VNC. 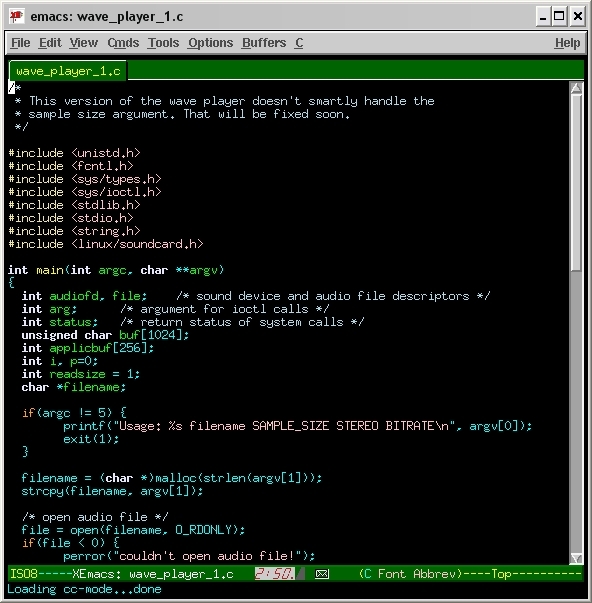 VNC is a free tool that consists of a client and server, both of which are very small programs and are available for Windows and many flavours of Unix. You need only download the VNC client to use the TLAB, Wilksinson Lab, and VLAB machines remotely, as they already have the server installed. 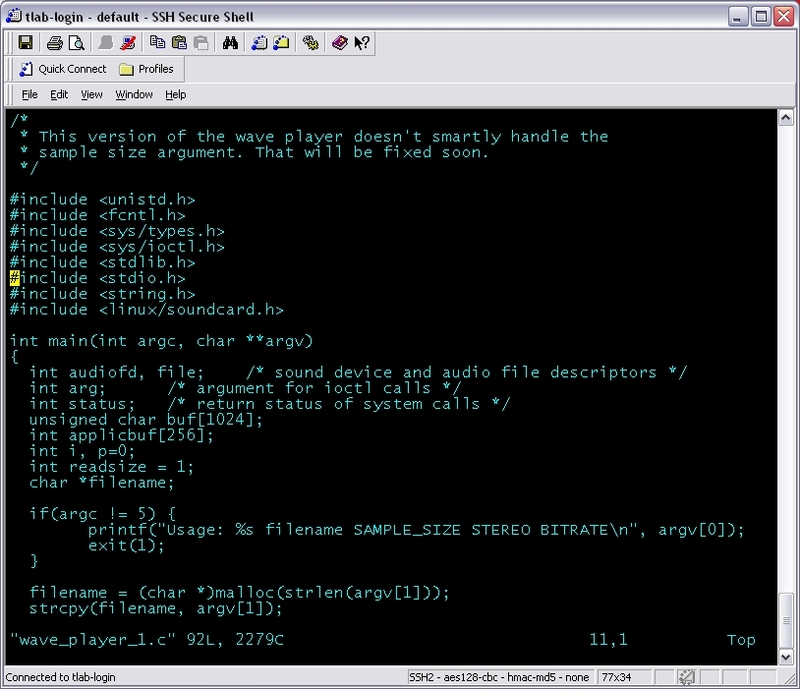 What the VNC server does is create an X11 Session, very similar to what happens when you log into the console of the computer, except that the X11 Session data exists in main memory instead of in the video card. VNC provides remote access to this "frame buffer" memory and sends your remote mouse movements and keystrokes to the X11 server. 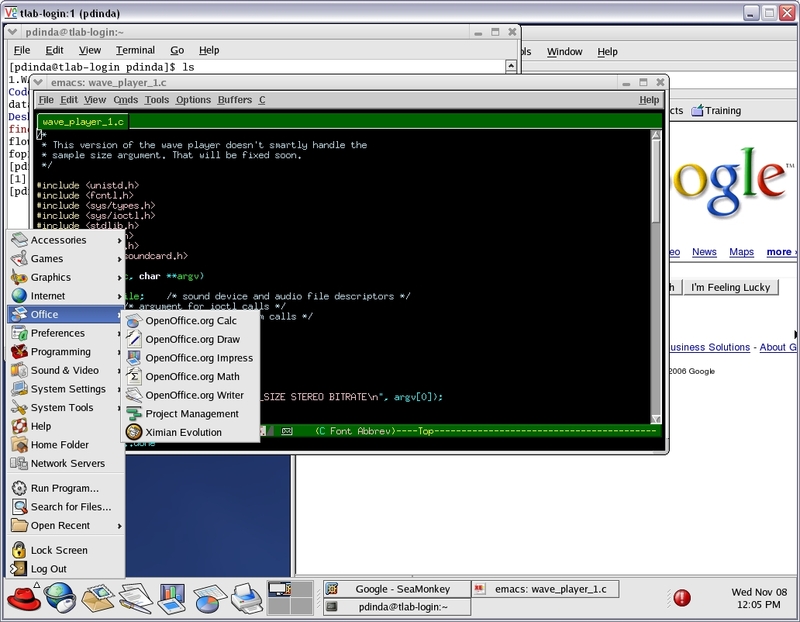 Multiple VNC sessions can exist on the computer at once; many remote users can have a "desktop" experience on the same machine. The vncserver command is requesting a 1024x768 screen with 24 bits per pixel. The first time you run vncserver, it will ask you to choose a password for your screen. Choose wisely! You probably don't want anyone else to be able to use it! You can change your password later using the vncpasswd command. An important thing to note in the output of the command is the name of the session. In this case, it is tlab-login:1. This is the same password you provided before. This is pretty ugly looking. Here's why. In X11, unlike Windows or the Mac, you can choose which window manager will be used. VNC, by default, chooses "twm", the "Tiny Window Manager", which is, well, tiny. But we can change it to use Gnome (the default manager in Linux) or KDE, or whatever we want. Let's reconfigure VNC so we get a gnome-session, making it identical to the experience of using the TLAB computers from the console. The VNC session you start with vncserver is persistent. It continues even after you log off of the machine. You must explicitly kill it using vncserver -kill. The only other ways it will stop is if an administrator kills it or the machine reboots. The VNC session persists in the face of network failure and client changes. When you disconnect from a session, the session continues to run. This means that you can reconnect to it later, including from a different client, and pick up where you left off. This is a very powerful and useful feature. The VNC session can be shared. You can configure it so that multiple people (lab partners, for example) can use it simultaneously. This is very useful for meetings. VNC clients exist for many platforms, including web browsers, pocket pcs, cell phones, and pretty much all operating systems. This means you can connect to your session from just about anything. Some computing environments (though not the TLAB) have firewalls that prevent traffic to/from the VNC ports (5901 and up). This is because some people perceive VNC as a security risk because the user determines his own password policy and much of the communication it does is unencrypted. Even if you are in such a restricted environment, you can still use VNC by tunneling it through SSH. Here is how to do this. Start up your VNC session with vncserver as you normally would. Note the name of your session. We want to create a tunnel from a port on your client machine to the port on the machine on which your session is running. If your session name is machine:1, then your port is 5901. If it's machine:2, then it's 5902, and so on. If you are using SSH Secure Shell on Windows, you have to set your preferences to include the tunnel and then reconnect. The following screen shows two tunnels, one for 5901, and one for 5902. Once the tunnel is in place, you can simply connect to localhost:1/2/3/etc instead of tlab-login:1/2/3. All of your VNC traffic will flow through SSH and benefit from its encryption. Most users can stop reading right now since VNC is probably what they want. However, you can also use X11 directly. X11 was designed specifically to make it possible to run graphical applications remotely. One advantage of using X11 instead of VNC is that you can arrange that all of your remote windows share the same desktop with your local windows. In VNC, all of your remote windows are confined to your VNC window. Another advantage is that performance might be better, especially on slow networks. The main disadvantage is that there is no notion of persistence: you can't switch clients without shutting down your programs and any temporary network failure will cause your programs to stop. 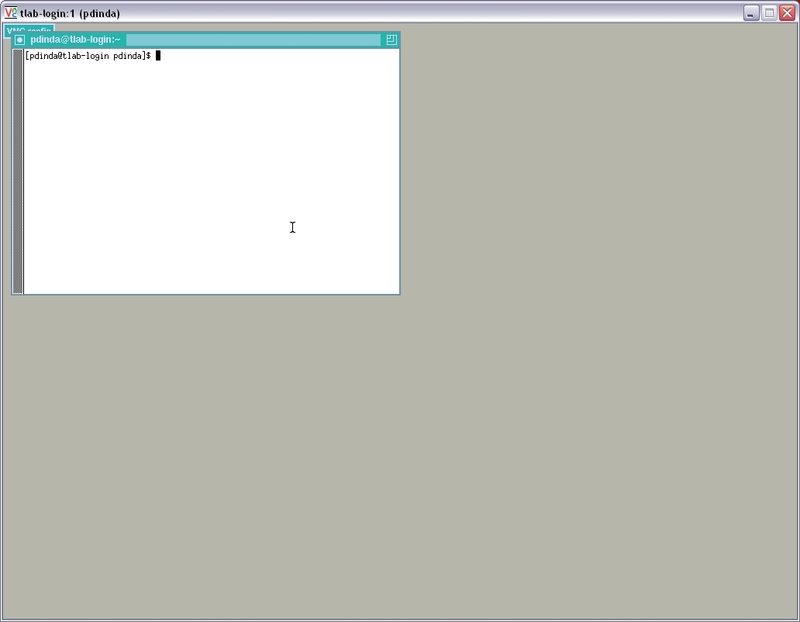 Another disadvantage of X11 is that the software is much larger and more complex than VNC. If you're using a Linux machine as your client, you already have X11. If you're using a Mac, X11 is available for free from Apple. If you're using a Windows box, you can either use the campus site license for XWin32 or the free X11 that is included in Cygwin. Many guides on using X11 make things more complicated than they need to be and suggest mechanisms that don't work well in a world of firewalls. If your client is not firewalled, it should be, and a firewalled client prevents the age-old "setenv DISPLAY client:0" or "export DISPLAY=client:0" model from working at all. The trick to using X11 easily is to use SSH tunneling. SSH tunneling not only provides a secure, encrypted connection for your X11 traffic, but it also manages the process of selecting a DISPLAY setting. Run the X software on your client. If possible, restrict access so that only local applications can connect. SSH-tunneled X11 looks like a local application. If using X11 forwarding via SSH as described above does not work, and local X11 programs do run correctly, chances are very good that the SSH server configuration on the machine you're logging into is severely broken and needs to be fixed.